Felix Chan based in London UK has created an innovative full-colour (CMYK) four colour 3D printer that allows you to create your 3D objects in a huge range of different colours by blending four colours together. 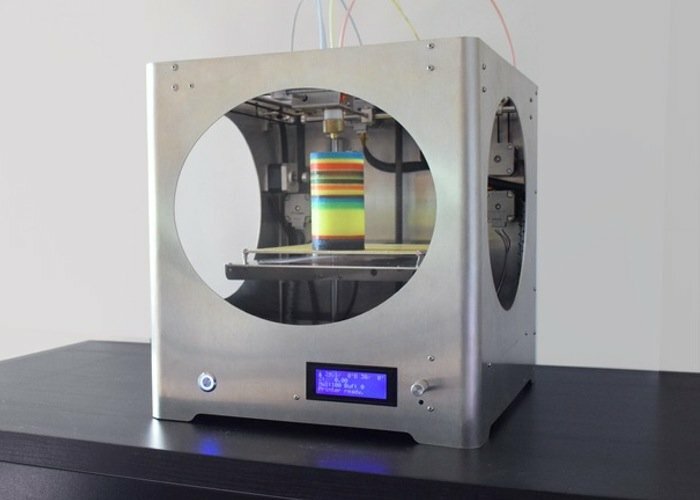 The new 3D4C 3D Printer is the first of its kind to allow users to use the four CMYK colours to blend unique variations to create 3D objects. Felix has been developing the printer for over two years, watch the video after the jump to learn more about this unique 3D printer and its blending capabilities. – The first truly 4 colors blending 3D printer. – Unique color blending hot-end extruder: provide accurate color blending. – Unique compact design, laser-cut cold-end extruders (4 units): ensure powerful and accurate filament delivery for 3D printing. – Original design Dual Building Platform with heat-bed: Platform 1 – MK3 Aluminium heat-bed. Platform 2 – 2mm laser-cut aluminium platform for large PLA printing (250 x 250 mm). – Special design electronics board: with 7 drivers to control 7 stepper motors. – Laser-cut Aluminium casing: to accommodate 7 stepper motors with a compact design, we use 2mm laser-cut brushed aluminium to ensure a stable framework for printing. – 0.4mm & 0.8mm dia. nozzles: the first 3D printer provide 0.8mm nozzles to enable extreme speed printing. The 3D4C printer can do that because it has a solid framework and accurate filament delivery system. All 3D4C printers come with 2 nozzles for different applications. – Seamless original design: to make a good product, you not just need a bright idea, but also a well thought original design. We think out of the box by using materials and manufacturing technique which no current manufacturers are using, and thus be able to make a high performance cool design. So if you think 3D4C 3D Printer is something you could benefit from, visit the Kickstarter website now to make a pledge and help 3D4C 3D Printer become a reality.